Greetings Beaders, Leah here from Eureka Crystal Beads! I’m excited to bring you the 9th installment of 12: Birthstones! At the beginning of each month I’ll bring you a blog that is chock-full of everything you might want to know about that month’s stone. Were you born this month? If so, you might take particular interest in my eighth blog in this series: GARNET, the birthstone for January. The word garnet comes from the 14th‑century Middle English word gernet, meaning ‘dark red.’ Interestingly, Garnet actually comes in many different colors in addition to the wine-colored gem that most people first think of. Garnet species are found in colors including red, orange, yellow, green, purple, brown, blue, black, pink, and colorless – with various reddish shades being most common. Because the chemical composition of garnet varies, the atomic bonds in some species are stronger than in others. As a result, this mineral group shows a range of hardness on the Mohs scale of about 6.5 to 7.5. Do you love the classic Garnet shade? Check out these fun options for that sultry deep red! FUN FACT: In addition to being known as the birthstone for January, It’s the state gemstone of New York, the Almandine species of Garnet is the state gemstone of Connecticut, Vermont utilizes Grossular Garnet for it’s gemstone, and Star Garnet (Garnet with rutile asterisms) is the state gemstone of Idaho! What a popular gem! The most rare and expensive sought after Garnet species is the Russian Demantoid Garnet. It has an unusually high refractive index, higher than ruby and sapphire, and this is one of the reasons for its impressive brilliance. But Demantoid Garnet also has remarkable dispersion or fire, the ability to split white light into the all the colors of the spectrum. In fact, Demantoid has a higher dispersion rating than a Diamond!! Swarovski makes a striking deep green that’s very close to this stunning Demantoid color! “Dark Moss Green” could be a lovely substitute – and when the light hits it…wow…truly an amazing shade. If you’re a believer in the metaphysical properties of stones, Garnet is considered a spiritual stone of higher thinking and self-empowerment in addition to a stone of strength and safety. It’s thought to being prosperity and abundance along with encouraging gratitude and service to others. It’s also rumored to keep the wearer safe during travel! With all these positive attributes, it looks like we all should be wearing a little something Garnet in our everyday life! Another popular color of Garnet (one of my personal favorites!) is Rhodolite Garnet! It’s a lovely and deep magenta that will keep everyone asking “what IS that stone? ?” Swarovski makes a lovely alternative with “Ruby” – a fantastic substitute that’s spot-on for Rhodolite!! Check out what we have to offer in this amazing shade by checking out the search results for “Ruby” on our website! I especially love it in small beads (like the 3mm Swarovski Crystal Bicones pictured here) as they begin to resemble small faceted gemstones!! Can you believe how similar the color is? Until next time, folks! Happy Beading! Previous Post JANUARY BEAD CHALLENGE! 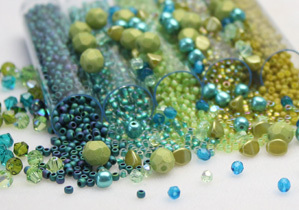 Next Post Enhance Your Beading with Winter Color Inspiration!